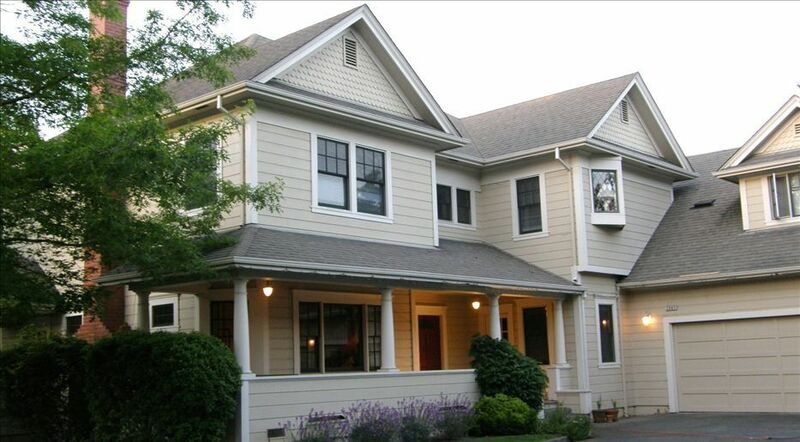 Winchmore House is a beautiful blend of Victorian and Craftsmen inspired architecture, located in Santa Rosa, the very heart of Sonoma County’s world renowned wine country with easy access to Healdsburg, Sonoma, Alexander Valley and Dry Creek Valley. Nestled along the banks of Spring Creek, our home offers something for everyone seeking a wine country vacation. Santa Rosa provides the perfect hub for visiting more than three hundred Sonoma County wineries as well as easy driving distance to the Napa Valley, and only sixty minutes to San Francisco. Within a 10 minute walking distance, you will find Montgomery Village with boutique shops, banks, a post office, a large grocery store and fine restaurants. Our beautiful home offers a charming ambiance, while equipped with modern conveniences. Built in 1992, and recently updated. At the end of a private driveway, in a quiet desirable neighborhood, our home is situated on approximately one third acre and offers approximately 2875 square feet of living area. Nearby Spring Creek creates the backdrop for the gardens and plentiful mature trees. Upon entering, via the large covered front porch, you arrive in the expansive entry hall with a grand redwood staircase and oak floors that continue throughout most of the first level. Beyond the entry hall, lies the living room with a wood burning fireplace, built-in bookcases and stately redwood columns. The large dining room with redwood paneled walls, features leaded glass windows looking out towards the back gardens and Spring Creek. The kitchen and nook area offer additional views of the garden and a lovely patio seating area accessible by two sets of French doors. The fully equipped kitchen has wide plank pine floors, stainless steel appliances, and a large butcher block island for easy meal preparation or gathering around for a glass of wine. Also on the ground floor is a large bedroom with a queen size bed conveniently located across the hall from the downstairs bathroom with pedestal sink, tub and shower. Near the bathroom is the laundry room with a full size washer and dryer. The second level of the home offers three bedrooms; the first features a unique leaded glass window with a full size bed. Further down the hall we have the large, master bedroom with queen bed, as well as a gas burning fireplace. The master bathroom offers two pedestal sinks, a large jetted tub, separate shower, a toilet room and travertine stone floors, as well as a walk-in closet between the master bedroom and the master bathroom. The third upstairs bedroom at the back of the house overlooking the inviting gardens comes furnished with a queen bed, and is conveniently located next to the upstairs hall bath. Our warm Mediterranean-like climate invites our guests to sit outside in the evening enjoying a wonderful home cooked meal with family and friends after a day of wine tasting. On Saturday mornings is the nearby Farmers Market with all types of locally grown fruits and vegetables, meats, fish and artisan cheeses. Among activities for the children (or children at heart), canoeing on the Russian River, Safari West game preserve and Train Town in Sonoma, a 30 minute drive to the Sonoma Coast are a few of the many choices. Guests may choose from a wide variety of acclaimed restaurants in the surrounding areas such as John Ash, Bistro 29, The Girl and the Fig, and many others. We are centrally located within easy driving distance of the rugged Sonoma coast and the scenic Lake Sonoma. Go hot air ballooning, or just enjoy a good book in our garden. Winchmore House has free high speed internet Wi-Fi access. At night take in your favorite television programs on our large flat screen high definition TV. We sleep seven comfortably but can accommodate up to eight. Owners live in an apartment next to the house. This peaceful setting is the perfect retreat for families, wine lovers and weekend getaways. No parties of any type. Central Forced Air, Gas Fireplace in Master Bedroom. 3 Places in the offstreet private driveway. Jackie's house is absolutely gorgeous. Eight of us came in for a friend's wedding and spent a long weekend here-- the four bedrooms are spacious, the kitchen is so large and open which made for wonderful big breakfasts, and the patio and garden is so pretty and pleasant. I want to stay longer! On logistics, Jackie sent us instructions on getting in and staying at the house well in advance and things could not have been easier. The house was also very, very clean and neat. Such a wonderful weekend! We'll be back! Good floor plan, easily accomodating 2 couples and 2 singles. Very comfortable, with plenty of room to get together or spread out. Convenient location, close to mall, highway access & Annadel State park. Great side deck for alfresco meals, barbecuing, just chilling and/or watching the local wildlife (e.g. deer, foxes). The perfect home for large groups! We so enjoyed our stay at Winchmore House. This large and beautiful home accommodated 7 adults and a baby beautifully. We especially loved the large kitchen and lovely outdoor spaces. Everything was clean and things we needed, like tons of towels were well supplied. The owners were nearby and available should we need them. Great experience booking this property and Jackie had been really easy to deal with. We enjoyed the house and felt at "home" right away. The layout and spaciousness was perfect for our 2 couples and teenager, with plenty of privacy for everyone. We also enjoyed the peaceful backyard--as others have said in their reviews, it's surprisingly quiet and peaceful, yet so close to main streets and amenities! Would love to return to this house for our next wine country visit! We are in the heart of wine country with 300+ wineries close by. Sonoma County is home to world renowned professional cycling in northern California. With 1400 miles of lightly traveled secondary roads. Serious bicyclists come to train as well as to compete. The Amgen Tour of California has included Sonoma County in it's seven stage route, Rugged coast line with miles of hiking trails. Above rates are for up to 6 people. For 6 - 8 people please add $50 per night per person. Major holidays $450 per night and a 3 night minimum.